Smart Security: Understanding and Contributing to the Business is a video presentation. Length: 68 minutes. In Smart Security: Understanding and Contributing to the Business, presenter J. David Quilter demonstrates the benefits of how a fully integrated security program increases business profits and delivers smart security practices at the same time. The presentation does away with the misconception that security is only an expense. In fact, a well-integrated security program can protect business interests, thereby enhancing productivity and net income. Quilter covers cost analysis and security measures and metrics, along with how to demonstrate return on investment and leverage executive leadership. The practices and tools discussed in this presentation will reduce business losses and help improve security and operations. 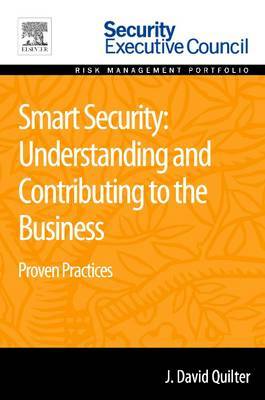 Smart Security: Understanding and Contributing to the Business is a part of Elsevier's Security Executive Council Risk Management Portfolio, a collection of real world solutions and "how-to" guidelines that equip executives, practitioners, and educators with proven information for successful security and risk management programs.